Airways Brewing Company (CBM Sponsor) out of Kent, WA makes a few different styles of Stout. The two you are probably most familiar with are their Chocolate Stout (rich, roasty and made with cocoa nibs and baker’s chocolate) and Maylani’s Coconut Stout. You get just one guess as to the special ingredient in that one. 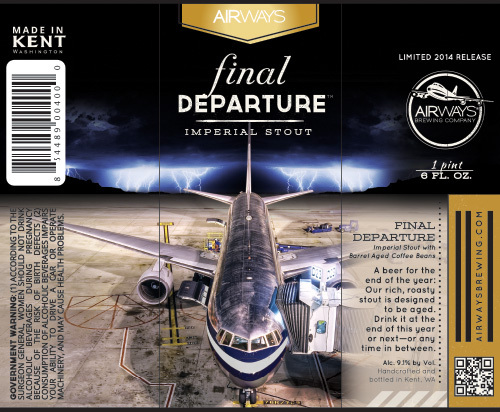 Now, returning for its third year, Airways Brewing is set to bring back Final Departure Imperial Stout. This year’s version, however, will have a special twist. It’s been aged on coffee beans from Rad Roasting Company which, in turn, were aged in whiskey barrels from Bainbridge Organic Distiller. KENT, Wash. (December 9, 2014) – Beginning Tuesday, December 9, Western Washington area craft beer lovers can begin stocking up on Airways Brewing Company’s® Final Departure Imperial Stout™. This is the third year the growing Kent-based brewery has brewed this beer. The 2014 version of Final Departure Imperial Stout boasts a 9.1 percent ABV and 70 IBUs. As Airways Brewing’s darkest and richest beer, notes of coffee and chocolate give way to a toasty finish accompanied by a firm hop bitterness. This limited edition stout is designed get better with age, so it can be consumed at the end of this year, or next—or anytime in between. Final Departure will be available in 22-ounce bottles throughout Western Washington and the Portland, Oregon area at select specialty bottle shops—including Chuck’s Hop Shop, 99 Bottles, Special Brews, Full Throttle Bottles, Beer Junction, Malt and Vine, Pint Defiance, Total Wine, Vashon Thriftway and more. Bottles will also be available for $7.99 at both Airways Brewing Co. locations and at airwaysbrewing.com starting December 9th. For more information, be sure to follow Airways Brewing Co. on Facebook, Twitter, Instagram, or visit www.airwaysbrewing.com. Founded in Spring 2010, Airways Brewing Company is a growing microbrewery located in Kent, Washington. Currently producing several year-round and seasonal offerings—including Sky Hag IPA®, Seat Kicker™ IPA, Loud Lady® IPA, Pre Flight Pilsner™, Maylani’s™ Coconut Stout, and PSA® Summer Ale—Airways Brewing also features limited edition beers throughout the year. Pints, tasters, bottles, cans, and growler fills are available at the brewery’s Kent Tap Room, open Tuesday–Wednesday from 3–8 pm, Thursday–Friday from 3–9 pm, and Saturdays from 3-7 pm (6644 S 196th Street, #T-100). Pints, packaged products, and delicious Northwest-style food can be found at the Airways Brewing Beer & Bistro in downtown Kent, Sunday–Thursday from 11 am–9 pm, and Friday–Saturday from 11 am–10 pm (320 W Harrison). Offerings from Airways Brewing can also be found in specialty bars, bottle shops and restaurants throughout Western Washington and the greater Portland, Oregon area. 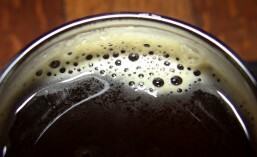 For more information about the brewery or Bistro, visit airwaysbrewing.com. First brewed in 2012 for the Mayan-predicted end of the World, which never came of course, Final Departure Stout is now a great way to celebrate not the end of the World, but the end of the year. Final Departure is available starting today, 12/9 at both Airways Brewing locations and should start appearing soon in local bottle shops.